Let me hear you say Boeuf Bourguignon with a French accent! Ready? Go! Please tell me you did it! I like to imagine y’all staring at the screen and practicing your best Gérard Depardieu impersonation. Because what could be more fun than that? What I reeeeally wanted to talk about today is this amazing, ultra comforting Boeuf Bourguignon, or Beef Burgundy in English, which is one of my favorite dishes ever and the perfect dinner for the cold weather. 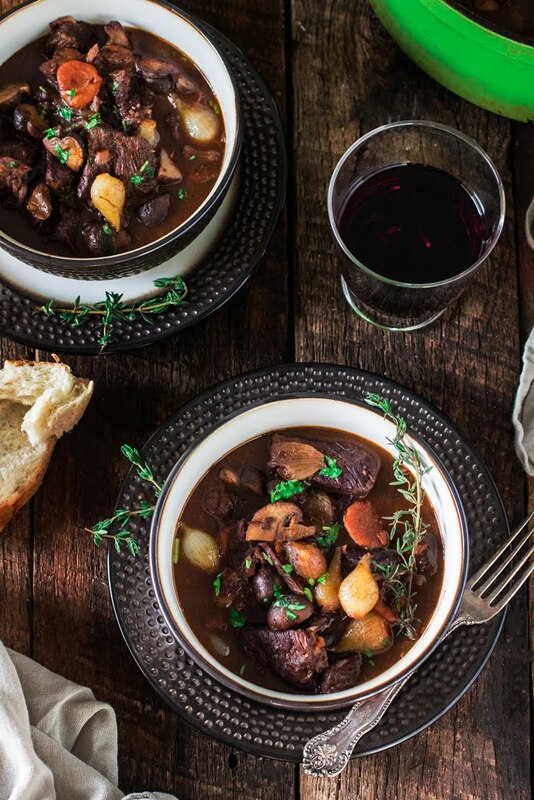 If you’ve never heard of it before, it is pretty much a beef stew made with red wine, mushrooms and pearl onions that was given a big fancy French name that has to be pronounced in your best Pepe Le Pew voice. – OK, I’ll stop! I’m sorry, I don’t know what has come to me today. Cabin fever, maybe? 4 days inside the apartment will do that to you! This traditional French classic originated in the Burgundy region (in Eastern France), the same region that gave us some other classics, like the Coq Au Vin and the escargot, and also known for its excellent wines. 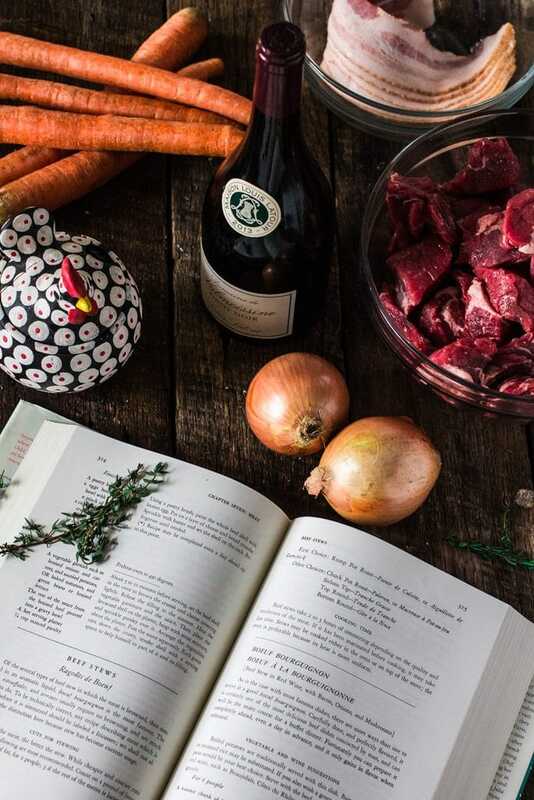 The original Boeuf Bourguignon recipe probably dates as far back as the Middle Ages (400 – 1400 A.D.) and it is believed to have been created by peasants, as a way to slow cook tougher, cheap, unwanted cuts of meat using ingredients they had on hand. Over time, this rich stew evolved from a peasant dish to a staple in haute cuisine and was made famous around the world, thanks to French chef and restaurateur Auguste Escoffier who first mentioned Boeuf Bourguignon in a cookbook in 1903. However, the recipe that makes the tables nowadays is the one Julia Child published in her book Mastering the Art of French Cooking. It is the recipe I use and the one I’m sharing here with you today, slightly adapted from the original to make it easier for the modern cooks (aka you and me!). This recipe might seem like too much work at first, but don’t get fooled. It is just a beef stew, after all! It does have a few steps to guarantee it is the BEST beef stew and I highly recommend you follow them. It is going to be worth it, I promise! 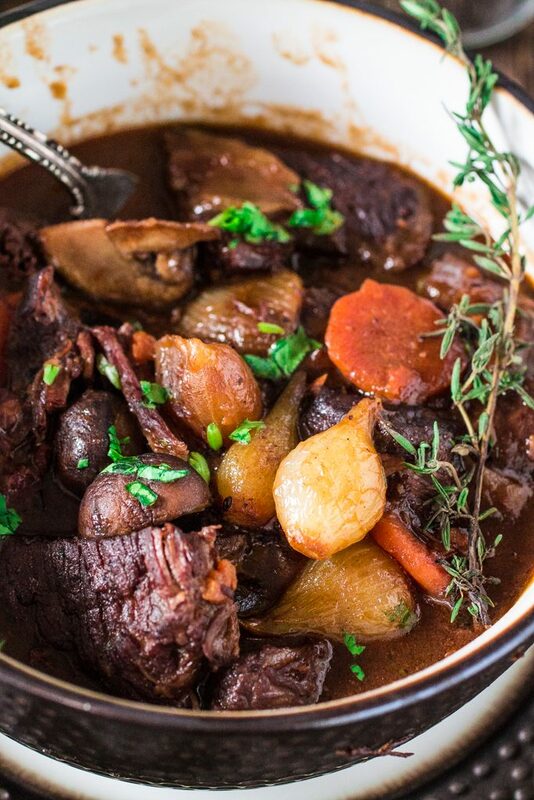 Boeuf Bourguignon is traditionally cooked with Burgundy wine. I was able to get a bottle of Burgundy’s Pinot Noir for under $20, which is not too bad! If you, like me, are a sucker for tradition, try to find an affordable Burgundy wine at your local wine store. If authenticity is not one of your concerns, any good red wine will do. Julia says it should be made with a full-bodied young red wine, like Beaujolais, Côtes du Rhône, Bordeaux Saint-Émilion or a Chianti. After you make this and inevitably fall in love with Boeuf Bourguignon, I recommend you also try my Carbonnade Flamande, my Brazilian Beef Stew, my Comforting Beef Stew and my Flemish Beef Stew with Caramelized Onions and Spelt Berries. Can you tell I love beef stews? I literally could eat it every day, especially during the winter! I also totally see this as Valentine’s Day dinner. What do you think? 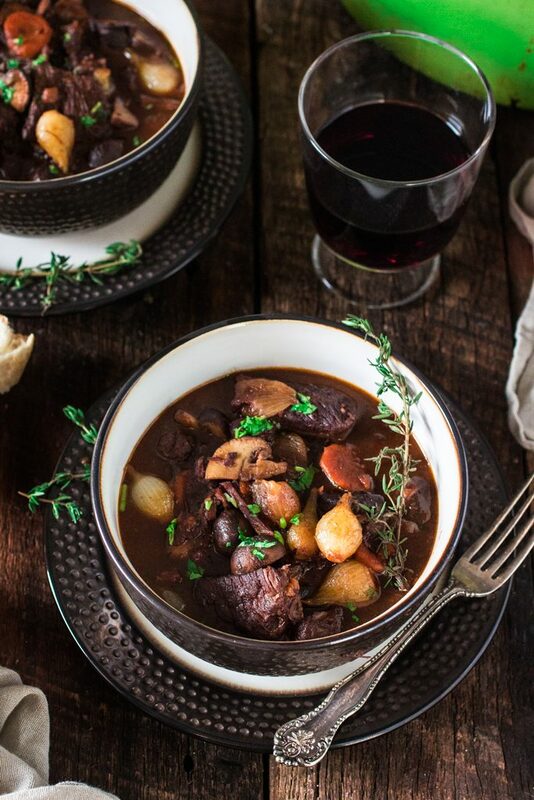 If your partner is anything like my husband, he/she will go nuts over this Boeuf Bourguignon! Nothing says “I love you” like beef that was braised for 3 hours! ? In a large dutch oven (or ovenproof casserole), over medium heat, heat the oil and, once hot, sauté the bacon for 2 to 3 minutes or until golden brown. Remove with a slotted spoon and reserve. Increase the heat to medium high and, working in batches, brown the beef on all sides in the hot oil and bacon fat. Remove the browned beef and reserve. In the same fat, add the onion and sauté until it begins to brown, about 2 minutes. Add the garlic and carrots and continue sautéing for another couple minutes. Return the bacon and the beef to the dutch oven and season everything with salt and pepper. Then, sprinkle the flour and toss to coat the meat. Transfer the dutch oven, uncovered, to the pre heated oven and let it cook for 4 minutes. Remove the dutch oven from the oven and turn the temperature down to 325 degrees. Set the dutch oven on the stove again, over medium heat, and stir in the wine and the beef stock, so that the beef is barely covered. Now it's a good time to scrape any remaining browned bits off the bottom of the dutch oven, using a wooden spoon! Add the tomato paste, the thyme and the bay leaf. Once it begins simmering, cover and transfer to the oven. Cook for 2 1/2 to 3 hours or until the meat is tender. The meat is done when a fork pierces it easily. Peeling pearl onions can be challenging, so here's a little trick: Bring a pot full of water to a boil. While the water is boiling, trim the root end of the onions. Then add the onions and blanch for about a minute. Transfer them to a bowl of ice water to stop the cooking. Pinch each onion at its stem end, and it should just slip out of its skin. If not, use a paring knife to remove the skin. In a large skillet, over medium heat, heat the olive oil and the butter until they are bubbling. Add the onions and sauté for about 10 minutes, stirring occasionally, until they are browned. Be careful not to break their skin! Pour the beef broth, season to taste and add the bay leaf. Cover and simmer slowly for 40 to 50 minutes or until the onions are soft (but retain their shape) and the liquid has evaporated. Reserve. Wipe out skillet and heat remaining oil and butter over medium high heat. Add the mushrooms and toss and shake pan for four to five minutes. As soon as they begin brown lightly, remove from heat. When the beef is done, remove from oven and separate the sauce from the beef, bacon and carrots, using tongs Reserve. Strain the sauce through a fine-meshed sieve set over a sauce pan. Skim fat off the sauce and simmer for a minute or two, skimming off additional fat as it rises. Cook until the sauce is thick enough to coat the back of a spoon. If too thick, add a few tablespoons of beef broth. Transfer the meat and vegetables back to the dutch oven and pour the sauce over it. Cover the dutch oven and simmer for 2 to 3 minutes, basting the meat and vegetables with the sauce several times. * Recipe slightly adapted from “Mastering the Art of French Cooking“, by Julia Child. Boeuf Bourguignon, Boeuf Bourguignon, Boeuf Bourguignon. There I think I did and no mess ups! Thanks for the wonderful recipe. I have a question about the oven temperature that mentioned is it Celsius or Fahrenheit? Hi, crazy question, but would you know a replacement for wine? I have a family member that will not eat it if there is alcohol, but I want to make them a French dinner because that is where her husband lived for a few years. Thanks so much! Alcohol boils off at 78 Celcius so the cooking process over 3 hours would completely irradicate ANY alcohol that would be present in the wine !! Could you substitute small potatoes for the pearl onions? What would you serve for dessert if this stew was the entree for a Sunday night birthday party. Also, are there any side dishes? And please offer an appetizer suggestion. So ready to make this! Very loved and long missed friends are returning home this coming weekend to windy, snowy, icy Massachusetts, from the Yucatan. Talk about weather shock! I want to make this but double it for a gathering of 12 ppl. Will this fit in my 6qt. Pyrex cassarole? I don’t have a cast iron or Enamel over cast iron Dutch oven. My only other option is my 10qt stainless heavy stock pot. It has handles that won’t melt. Would so appreciate an answer. Thank you and I love your descriptions.